Better leisure in Taunton Deane including Wellington is proud to host Swimathon 2018, as just a small number of a record number of Better UK Leisure Centres supporting the event. Swimathon, the world’s biggest annual fundraising swim is back for 2018 and swimmers across the UK are encouraged to jump into a participating pool and raise vital funds for Cancer Research UK and Marie Curie, two charities leading the way into the research and care and support of those living with cancer. The event began in 1986 as a pilot programme for swimmers based in London only, and has since grown to be a nationwide, annual event with nearly 700,000 participants taking part and £48 million raised which has been distributed to 36 different charities. The event this year will take place from Friday 27th – Sunday 29th April. Alternatively, participants can choose to take part at a time which works for them with MySwimathon from Friday, April 20 - Sunday, May 6. Swimmers can challenge themselves to the 5k, 2.5k, 1.5k or 400m Individual or Team 5k or 1.5k distances. Why not take on a swimming challenge today? You can get friends and family involved in a team event and raise funds for two very worthy charities. 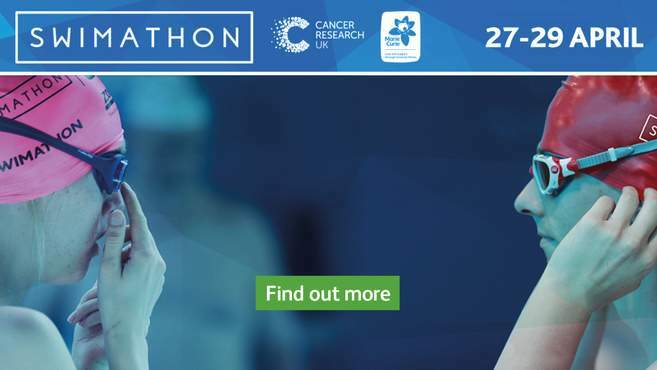 Cancer Research UK and Marie Curie are the official charity partners of Swimathon 2018.